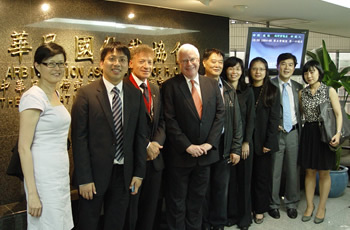 To celebrate the new Taiwan chapter and the visit of the President of CIArb, Jeff Elkinson, an international arbitration symposium was hosted by the East Asia branch in Taipei on 15 June with the kind assistance of the Chinese Arbitration Association (CAA) who provided their premises. The symposium was split into 2 sessions; "How to draft a good international arbitration clause" and "How to use the CIArb guidelines to improve your arbitration". Some 75 people signed up for the event though the numbers which showed up was reduced by heavy rains in Taipei. The panels consisted of the president, Jeff Elkinson, Colin Wall who is a member of the board of Trustees, Mary Thomson from the East Asia branch committee and Helena Chen a partner of Formosan Brothers Taipei. There was plenty of interactive and lively Q&A as the questions kept coming. The symposium finished with a cocktail. The event was sponsored by the law firms of K&L Gates and Formosa Transnational. Prior to the symposium, the Chairman of the CAA, Mr Nigel Li, hosted a lunch for the President, panel participants as well as the organisers (in particular Houchih Kuo) and sponsors of the event.